Sleeveless top in exquisite glass beaded and embroidered floral design on organza. Fully lined top; side slits; biased finished arm holes/neckline; exposed satin tape with silver metal teeth back zipper. Very limited edition release. Summer Luxury. We’ve taken two aspects of summer – flowers in bloom and sleeveless tops – and created an essential that brings effortless luxury to your summer wardrobe. 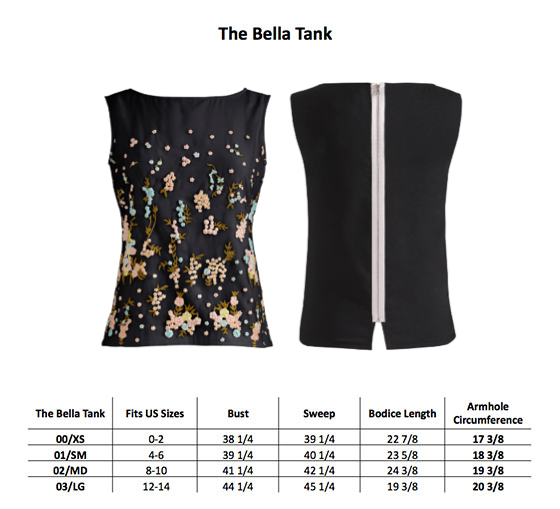 Our discovery of this exquisite glass beaded and embroidered floral design on organza fabrication was the perfect match for our Bella Tank design. The top is fully lined and features side slits, biased finished arm holes/neckline and exposed satin tape with silver metal teeth center back zipper. The perfect partner for all your summer outings. Due to the special nature of the fabrication, this release is one of our very limited edition releases.